New Haven, CT - So many big questions are popping up before the CIAC championship. Will we have Miller time x 2 in the girls sprints? What stratosphere will US #2 high jumper Chet Ellis sky to? Can any team pull off a double with two relay wins? Will Michael Browning shoot past 60 in the shot? Will we be able to nail down all 30 winners for interviews on Saturday? 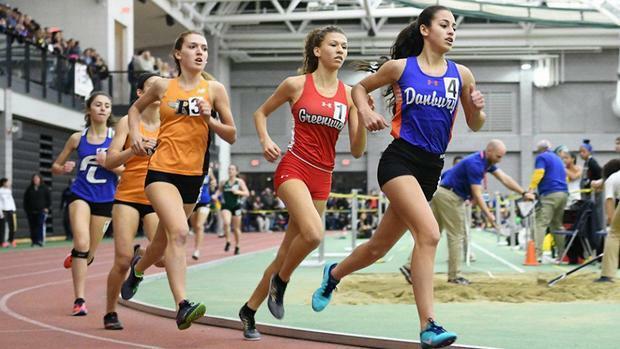 On the team side of the action, last year's results for the boys were Danbury 44, Hall 37, Derby 26, Staples 24, Hartford Public 21, and Wilbur Cross 20, while for the girls it was Greenwich 56, Danbury 32, Hillhouse 28, Bloomfield 25, and Fairfield Ludlowe 20. This year's LL-L-M-S Class winners of Hall, Xavier, Hillhouse, and Bloomfield for the boys and Danbury, Windsor, Hillhouse, and Bloomfield for the girls should all be in battle to find out who's the greediest, but some runners-up and other worthies such as Norwich Free Academy, Suffield, and Wilbur Cross on the boys' side and Glastonbury, Darien, and Ridgefield for the girls should also be in feeding frenzies. Note that neither converted times at major invitational meets for distances such as the mile, 2 mile, and 3000 meters or any times from the Yale Track Classic are included in the CIAC seed times in the Start Lists, which come from Class meet results. We have sprinkled the competitors' best marks into the preview where appropriate in the belief that big performances at big meets may well reflect what can happen at a state championship. Begins 12:00 on Saturday, February 16 at Floyd Little Athletic Center, next to Hillhouse HS.